The Quarter Dog Pose with a Twist is a lovely pose that opens your side body and stimulates your internal organs. It is a mild twist, and should be the first one you try, if twisting is a difficult motion for you. Don't let the mildness fool you, it is still a very therapeutic pose. The opening of the body through the practice of Yin Yoga, done in a contemplative fashion, is healing indeed. Creating internal harmony through yoga poses helps you stay focused and present. If you are unfamiliar with the mindfulness practice of Yin Yoga, please click on the link to learn how it differs from the traditional yoga as practiced in the West. It is important that you understand how to perform a Yin Yoga Pose to find just the right edge to be therapeutic. From the table top pose in the photo above, walk your hands forward, as you bring your chest toward the ground, keeping your hips stationary and high. If you sit back on your hips, this will be more like the child's pose. You know you have the pose right when you feel the opening through the chest, side body and shoulders, instead of the hips. This is the Quarter Dog Pose, known in traditional yoga as the "Puppy Dog," a variation of the Downward Dog. In fact, if you curled your toes under your feet, pushed through your feet and hands, and extended your legs, you would be in the Downward Dog. Some also call this pose the Half Dog or the Melting Heart. Quarter Dog Pose or "Puppy Dog"
You may remain in the Quarter Dog for a few minutes, expanding through your chest and shoulders as the weight of your upper torso sinks ever lower toward the ground as shown in the photo above. You may cradle your head in your elbow (shown) or you may put both arms over head, placing your forehead on the ground, if desired (not shown). If you are really open, you might even be able to turn your head to one side or another. As you belly breathe, let your heart melt into the ground. When you are ready, move into the twist by lifting your upper torso, pushing strongly through your right hand as you extend your right arm (if it was bent). Then take your left shoulder and place in on the ground as you twist through the waist. The left arm is extended reaching through the left fingertips as you place your entire left arm under and through your right underarm and onto the ground. This is the Quarter Dog Pose with a Twist, shown in the photo below. Hold this pose for 3-5 minutes, all the time breathing deeply as you relax and release any unnecessary efforting through the arms and upper body. If after a while you find that you have more opening, you may come to your next edge by taking your right arm up to wrap around your back, as your right hand reaches for your left thigh. This will open your shoulder and heart more as you deepen into the twist. You can see a photo of this arm around the back motion, on my Wide-Kneed Child's Pose page. The poses are similar, with the difference being in the height of the hips. If your discomfort is strong enough at your first edge, do not attempt the deeper twist, but do try it another day as you learn this pose. Our bodies present to us differently on different days anyway, depending on what is going on in our lives, and you may find that another day you will be more open. Especially if you continue to practice this pose. At any time your discomfort is too strong, just lift up and out of the twist and sit back on your hips to go into the Child's Pose. Never, ever push yourself through the strong effort of your will. A yin practice stays with what is, allows time, body weight and mindfulness to take the body deeper into the pose. Always remember to breathe throughout the pose and repeat on the opposite side for an equal amount of time! The twists stimulate your core though the squeeze and soak method. The internal organs are squeezed out of the old blood, then refreshed with the new blood when the twist is unwound. This revitalization is also enhanced by the mild inversion effects of the pose. An inversion is when the head is lower than the heart, and in the yogi tradition, it is believed to be the practice that brings longevity! 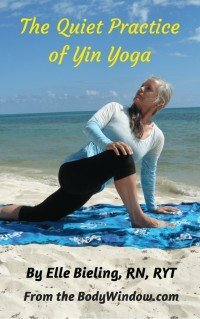 So take your graceful aging to a new level when you practice this pose! If you combine the Melting Heart with the Quarter Dog Pose with a Twist, as described in the sequence, below, you will also get the therapeutic effect of opening the chest, and stimulating the heart and lungs. This is very therapeutic for those with asthma, allergies and other respiratory conditions. So many of the Yin Yoga poses can be varied with a twist, to make wonderful sequences, going from one side to another, in and out of the twist and in and out of Yin and Yang energies. This sequence stimulates and opens your 3rd and 4th Chakra energy and emotional centers. If you have heart, lung, internal organ, intestinal, self-confidence or self-love issues this sequence is very therapeutic for you! This practice as described above would be a great 20-30 minute routine that you could incorporate into your home practice. Not many activities break up tight fascia and open the body more deeply than the practice of Yin Yoga. It is the panacea for aging, it helps create an open and flexible body, and because it is the deep fascia that holds tension and emotions, this routine will be an emotional and therapeutic release as well. May your practice of the Dog Poses, especially the Quarter Dog Pose with a Twist be releasing and revitalizing! May it juice your joints and tissues and keep you in the moment through your ongoing mindfulness of your edges! Namaste!